Ginkaku was a notorious criminal from the Village Hidden by the Clouds along with his brother, Kinkaku. They are called the Gold and Silver Brothers. They have the abilities of the Nine Tails as they ate the flesh of the Nine Tails when they were swallowed. Let’s take a look at Ginkaku’s abilities. Taijutsu & Ninjutsu Benihisago – Absorption[Prompt]: Causes damage to a selected unit and Immobile. If the opponent’s unit is defeated, it cannot be revived. Furthermore, if the unit suffering from this attack your opponent’s last unit, this attack will have 100% more damage. Taijutsu Taijutsu Attack: Attacks the opponent’s units in the front row and has a fixed chance of causing Repulse and Acupuncture. Taijutsu Seven Start Blade: Chases and Attacks a Knocked Down unit, causes Low Float and Acupuncture. Can be triggered twice each round. Ninjutsu Aiming to the Top: Will add an extra 50% damage to Kage ninjas. You will only receive 2 star ninja of Ginkaku. 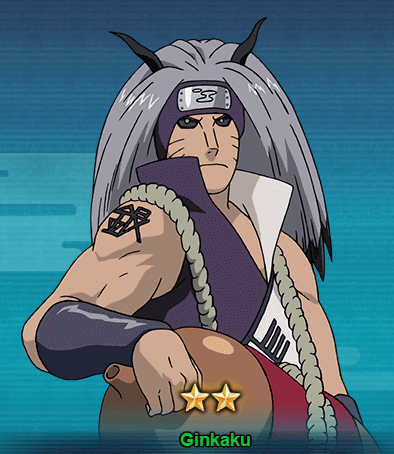 You can draw him from the Edo Tensei treasure within 30-40 seal scrolls or Great Ninja War (GNW) treasure in 10-20 seal scrolls draw. You can also get him from Sakura Festival at times when he is available.